I’m back from my mission trip to Belize, and I’m happy to report that it was a phenomenal trip. It was a great experience for myself, my wife and our three kids. We experienced many new things, and learned a lot about the local culture. Thanks in part to many of you who contributed to our online fundraiser, we were able to donate over $10,000 to the ministry, and I will tell you that it was a huge blessing to them. So thank you for your help. We were working with Laugh Out Loud Ministries, and it was awesome to see what they are doing in southern Belize. 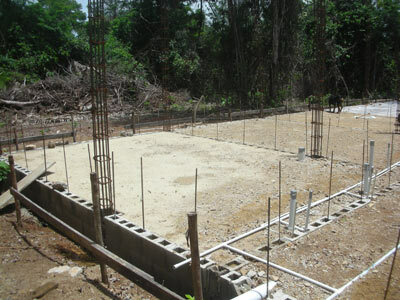 While there, I helped with the construction of the first building on their property. The jungle is amazing, and it’s a very challenging place to build something. We experienced some flooding from the massive rains that occurred nightly (it’s rainy season), and learned to sleep through loud thunderstorms while nestled under mosquito nets. On our final day, we were privileged to eat dinner in the one room home of a native Mayan family, in which the father of nine children was celebrating his 39th birthday. The meal was simple, but you’ve never had corn tortillas like the ones they made. 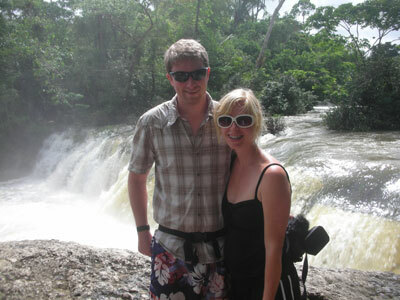 My wife and I in front of a waterfall. The building foundation I was working on. 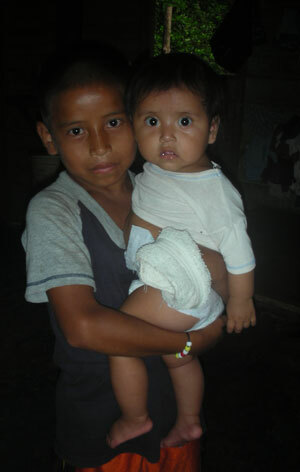 Some Mayan children we became friends with. Thanks again for your support and prayers! I’ll be back to posting more lessons starting tomorrow. Sorry it took us for awhile to answer back. Thank you for your tips. Yes, our website is in a serious makeover. By the way, may we please ask if pay per clicks are good investment opportunity? We started investing already in one paper click and its really making good as far as ROI is concern. We just wanted to hear what you wold say about it. Thanks for the tips and the sites. We are in the process of making our business online. As for whether its a good investment, it just depends on the ROI, as you mentioned. Its definitely a good opportunity if you know what you’re doing. Just be sure to track your campaigns closely, and if you’re already making money from it, that’s great! my family and i went on a cruise and belize was one of the ports. and they wouldn’t let people get off the bus inside the city.so i didn’t know if they still had cannibalism there? I was just woundering if ther still cannibalism there? well how long you will stay there ? Eric…I have seen you on IM promotional videos and noticed a sincere difference about you. I pray that God richly bless your family and use you in the IM world to be a light to people trying to make money online. I believe God has given me entrepreneurial gifts and leadership to, as Deut. 8 says, create wealth…but I want to give more back to God and see lives changed, families changed, hopes renewed and relationships restored. My wife and I want to start a family in God’s timing but I feel compelled to get rid of all debt and become free to give MORE, free to give, well…freely! I feel like you brother and haven’t even met you. It’s nice to see internet marketers who care about Christ, care about ways to do well online, and care about doing things ethically. I hope you get a chance to email me out of your busy schedule and touch base. Perhaps I can learn tons from you regarding seo, ppc, internet marketing, and help keep me focused instead of getting lost in the inbox overload! It’s easy to get lost! God bless your family and may you enjoy a wonderful 2009…some of God’s greatest gifts are the blessings of family and health, but I praise God mostly for the storms, for the climbs, for the confusion and for the disappointment. There I have found the greatest growth and greatest moments of true worship. Much love, brother…keep blessing the IM world with the light of Jesus, our Christ! You are blessed person. Keep on doing your God loving work. It’s great. May God always bless you n your family. Stumbled on your site looking for info about lol. My daughter is filling out a app to go help for a year. Don’t know anyone who has been there, only heard about lol through a friend in Colorado. Very impressed how much $ you were able oo raise for them. She has to get her support for the year and am wondering if you have any tips for her. She is 19 and just starting life. We belong to a100 plus calvary Chapel congregation, so there is not a lot of finds there. We also love in the country. I know God will provide, but proverbs says to seek wise counsel;) She is by profession a graphic designer and talented artist. The website the college told her to work with we found out the day she went to launch it, after spending months setting it up, was 120 a month. She was told it was free.IIt would be nice to her some side work online while she was at lol to help fund her trip herself. I don’t know how reliable their connection is though and if there is such a thing as a “free” website. I don’t know what you do exactly, but ANY advice/ help to getting her down there concerning ANY of the above issues would be great! It must be an awesome ministry if you went 3 times! We are very excited. A realistic minimum investment for an online business would be about a couple hundred dollars, for web hosting, a domain name, an autoresponder service, and a product to start selling. There are also free methods for running your business as well. Have you checked out Eric’s recent product, the No Cost Income Stream 2.0? It sounds like it would be a good fit for what you are looking for. I’m a young Belizean woman who currently lives and works in Belize. I just joined the real coaching club today and have just started to go through the “Eric’s Tips” lessons, and came across the previous post about your mission trip to Belize and now this one. I was thrilled to see Belize being mentioned like this because I have not heard Belize mentioned in this manner often. Anyways, just wanted to say thanks for mentioning my country and the next time you’re in the country, if I’m still here and not travelling outside Belize, then maybe we can go to the cayes or something. Anyways, thanks for doing the real coaching club program and I hope that I can start making at least USD $1000/mth following the coaching.